How do I add an external URL as a module item? You can add a URL link to your modules. 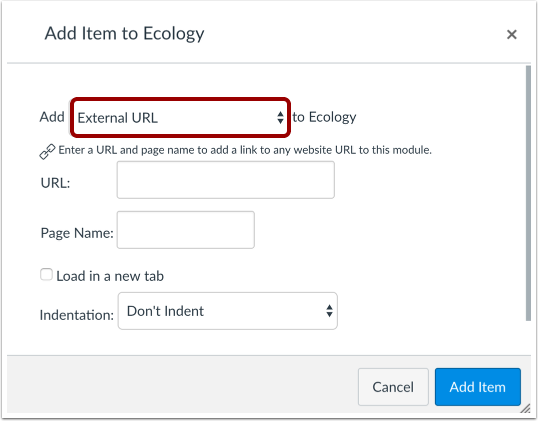 When adding an External URL to a module, the dialog box includes an option to load the URL in a new browser tab. When this option is selected, Canvas will display the page to students outside of Canvas. 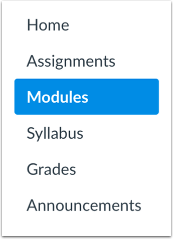 If the External URL is part of a module requirement, Canvas will also register the progression so that the module footer will appear and allow the student to advance to the next module item. When this option is not selected, the content is embedded in an iFrame for easy viewing. However, some sites have disabled embedding and require users to open the content in a new window. Users can open the link in a new window by right-clicking the link and selecting the option to view in a new window or tab. Note: Numerous module items may affect performance. Modules supports up to 100 module items in the student progress page. In the Add [Item Type] To: drop-down menu, select the External URL option. Type or paste the URL in the URL field . Give your External URL a page name . To have the URL open in a new browser tab, click the Load in a new tab checkbox . Choose whether or not to indent the item in the module drop-down menu . View the external URL in your module. Previous Topic:How do I add an external tool as a module item? Next Topic:How do I duplicate a module item? Table of Contents > Modules > How do I add an external URL as a module item? Thank you everyone. Perhaps I wasn't clear--I can definitely see how you can embed LINKS to external sites. I am asking if there is a way to iframe a webpage within Canvas even if the page disallows embedding. If I'm reading this right, you're trying to embed a page in an iframe in Canvas but the page you're trying to embed is blocking the embed? If I have that right, then unfortunately I don't believe it's possible. While I'm not an expert in web development, from what I understand if a website is blocking iframe embedding, there's usually code embedded in the site that disallows it globally or code on a server file that tells the browser to not allow it. Either way, this would be an issue with the other site and there's nothing Canvas would be able to do about it. However, as I said, I'm not an expert on this. You may want to also ask in the Canvas Developers group here in the Community where there are people who know a lot more about this sort of thing than I do. I wanted to follow up with you and make sure we answered your question. If you still have questions or concerns, please don't hesitate to reach out. Otherwise, if this has been resolved, no further action on your part is needed. This thread will be archived in several weeks. Why would you choose to add an external URL to a module as opposed to creating a hyperlink within the text on a page? What are the benefits of adding an external URL in a module? Is there a way to add context to the external URL so that it is accessible? There are two main advantages that I can think of, however depending on how you design modules, there may be others. First, this saves time and extra clicks and puts a URL front and center in a module instead of buried in a page or assignment. This option simply makes it easier for students to find and click on the external website. Second, this makes it possible to add viewing the external URL as a Mastery Paths module requirement. A student will have to click on and view the website in order to mark the requirement as complete. 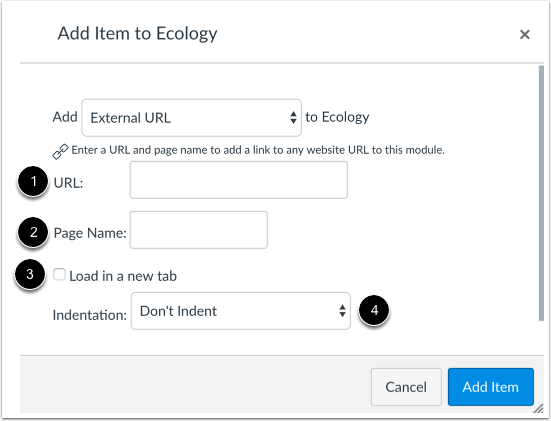 If you embed the URL in a page, the student will need to view the page, but there is no way to tell if they clicked on any links within that page and clicking the links in the page will not affect module requirements at all. As far as adding context for accessibility, you can only add the link, link title, and determine if it opens in a new tab or in an iFrame within Canvas. What other URL context would you have in mind for an external URL? I wanted to briefly follow up with you to see whether Nathan helped answer your question and to ask if you have any further questions. We're always happy to help if we can! In the meantime, if we don't hear from you or if you let us know that your question's been answered, we'll go ahead and mark this comment thread for archival. We periodically remove comments from the Canvas guides to keep them updated and tidy. However, we appreciate your feedback and questions, so please reach out if we can help. Re: how can I copy and paste a URL? Re: Where can I put a file or a link that I want students to have access to all year long without having to scroll page by page?